If taxes are not paid timely, and the IRS is not notified why the taxes cannot be paid, the law requires that enforcement action be taken, which may include issuing a Summons to the taxpayer or third parties to secure information to prepare unfiled tax returns or determine the taxpayer’s ability to pay. The examiner can use a summons to compel testimony and/or the production of relevant books, papers, records, or other data. The information, however, must already be in existence. 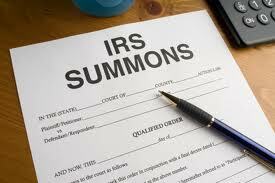 A summons may not require the creation of documents. Original documents, not just copies, may be summoned. Also, a summons may request more than written materials. Examiners may summon computer tapes, video cassettes, handwriting exemplars, and any other type of information. any other person that the examiner deems necessary. If the examiner needs to obtain the books and records of an exempt organization, he or she should serve a summons on an officer, director or managing agent of the organization. Lefstein-Suchoff CPA & Associates, LLC may help you file a petition to quash the summons with the court if notified timely, and help you file multiple year tax returns that involve back taxes. This entry was posted in IRS Notice and tagged Back Taxes, File Returns, IRS Problem Help, Late Filing of Tax Returns, Tax Problem Solutions. Bookmark the permalink.